Base Primary Education on Determining a Student's Special Intelligence. and Intrapersonal. Curriculum should maximize special intelligence. 2) Core Intelligence centers on mathematical-logical intelligence and verbal intelligence. Skills related to core intelligence are emphasized by traditional curriculums. A year-round school calendar of four twelve-week terms with 4 plus 2 hour days for Secondary Education will improve learning and decrease cost. The U.S. has the best universities in the world and students only have 15-20 fifty-minute class periods per week. Our most successful students also have structured unstructured time for labs to apply knowledge or get involved with skill improving extracurricular activities. Germany schools produce the world's most productive workers and more than half her students finishes at 1 PM. A 4 plus 2 day has four 50-minutes traditionally structured classes in a row and two hours of structured unstructured time when a student's Individualize Curriculum is determined. Students can work, take more academic classes, volunteer, create a group to compete for academic prizes, attend career-focused academies, play sports or let American ingenuity provide relevant learning experiences. 2) A two-tier classroom system has enhanced student work benefits. 3) Financial benefits for teachers result as they can teach overload courses in their off session. If a system's average teacher earns $50,000/year for sixteen courses or $3,125 per class for a year round morning assignment they could earn say $2000 per course for additional afternoon overload courses. Sixteen overloads cost $32,000 saving $18,000 or 36% of a salary plus fringe benefits and also make for happy teachers. 4) Economic facilities use would solve housing problems. The potential cost saving for large school systems making maximum use of their facilities are unlimited. Students discover and enhance their "Special Intelligence." with " Individualized Curriculum"
2) Career availability information should help students with their curriculum choices. Prelude 1: Changing Education Paradigms from Royal Society for Encouragement of Arts, Manufacturing , Commerce is a 12 minute video depicting how our education system went astray. It has led some to believe that Germany has redirected her education system in an appropriate direction. Prelude 2: Current Leaders Advise from Larry Summers, Ralph Waldo Emerson, FDR, Winston Churchill...l are just of the few of the great leaders who have advised us concerning our educational system. 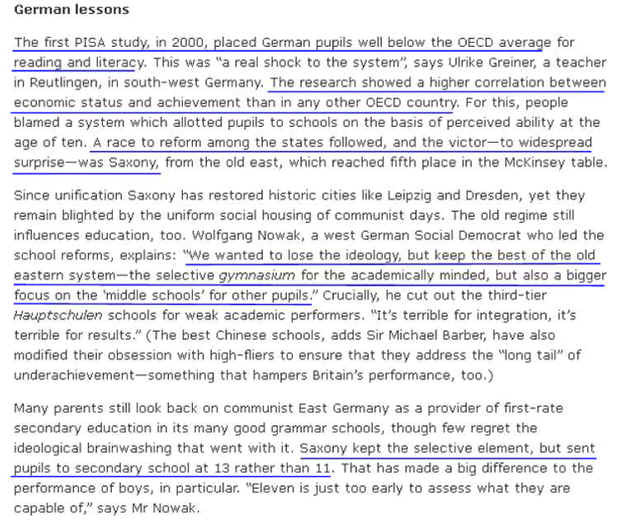 German compulsory schooling begins at age six and may continues through age eighteen. Children between the ages of three and six may attend a Kindergarten (day-care center, nursery school). Enrollment is optional. Kindergarten [pl.] are operated by municipalities, churches and charitable organizations and are not part of the state's compulsory school system. By making students read what the system wants and not what the student wants means too many students never really learn to read. Learning to read is key and what they read is secondary. The idea that you taking CIVICS or studying US History makes someone a good criticize seems unrealistic. Taking General Science for students who don't like science was like me taking Gym. It was a waste of time. Let students study what they want to study and manage their studies. Can you imagine all the money we spent educating these mechanics and they couldn't read. Algebra was not the problem. The term length of a senator versus a house member wasn't the problem. They couldn't read! "It is important to put these trends in perspective. American schools are not worse than they were in a previous generation. Indeed, the evidence is to the contrary. Results from the NAEP long-term assessments show that most American students now master foundational skills as defined 40 years ago—for example, reading well enough to follow directions. Today’s education problem stems from the increased complexity of foundational skills needed in today’s economy and from the changes in family income and family structure that leave a significant portion of American children unprepared to learn when they enter school." He is correct. There has been an increase in the complexity of foundational skills needed in today’s economy. He is wrong that the changes in family income and family structure leave a significant portion of American children unprepared to learn when they enter school. Why? Because intelligence is normally distributed and it is impossible to increase large numbers of people capable of mastering these more difficult foundational skills. Just find the selected few intelligent people and encourage them to develop foundation skills and reward them economically. P-Tech Early College High Schools are vocationally oriented. From Pew Institute: Millennials will benefit and suffer due to their hyper connected lives seems directed toward the top thinkers. 1) Primary Education should not be so rigorous that a substantial number of students dislike school. The first 6-8 grades should be changed to concentrate on a student does best, their special intelligence. Gardner's multiple intelligences which include Mathematical, Spatial, Bodily Movement, Musical, Verbal, Interpersonal and Intrapersonal is a reasonable model.
. Curriculum should maximize special intelligence. 3) We must adjust curricula to acknowledge that technology helps those with high mathematical-logical and verbal-linguistic (problem solving, fix or repair, programming) intelligence more than those with Spatial (dance, sports, driving a bus), bodily-kinesthetic (acting, mime, sports), musical-rhythmic (composing, playing music, clapping, reading, using words, public speaking, storytelling, interpersonal (social skills, reading other people, working in a group), 7. interpersonal (introspection, self-assessment, goal making, vision, planning), 8. Naturalist (able to distinguish among, classify, and use environmental features) intelligence. see The Sagging of the Middle Class. 6) With only 4% of the jobs requiring an advanced degree, a bachelor's degree should be solely directed toward entry level careers, not graduate school. That is, a nursing student should not have to take statistics (a course I taught for 35 years) because they might some day go on for a master's degree. So for every 100 nursing students who take statistics, 10 might need it later and by then will have forgot what little they learned or choose a non-quantitative thesis. 7) Because the economic Laws of Diminishing Returns and Diminishing Utility apply to the learning experiences, the school year should be expanded to four twelve-week terms. Schools would have four hour sessions a few times a day. Teaches would be required to teach four terms per year. Teaching additional courses for extra pay or to accumulate leave time would be encouraged Leave time would be an earned privilege. For example a teacher earning $64,000/year for a morning shift or $4000 per course might teach an overload afternoon course for $2000. Four teachers doing this would save half a salary for society. Ambitious students could take courses in the second session or use the time to participate in projects like First Robotics Competition, First Tech Challenge, and First Lego League. P-Tech uses the extra time to help students earn an associates degree while earning a H.S. diploma. This system would be advantageous for vocational HS as it provides time for students to work. Two talented students might even combine for a full time job. . A lower minimum wage for part time students not requiring payroll taxes would help. Sports would benefit as students might attend morning classes and practice in the afternoon and a second sport would do the opposite thus making much better use of facilities. School systems could retire older facilities and free rooms could be rented to people wanting to run morning and afternoon day care for working parents. Teachers and HS students could work in day care programs for a reasonable fee. Students wishing to graduate early could take extra courses during a different session for a fee. 8) Students would take four courses designed so students can progress at their own pace. 1) Communicating, 2) Math/science 3) Social Science 4) Whatever they want excluding courses 1-3. 9) Tech-based Education would apply to college education immediately but hopefully soon spread to secondary education. 10) The Quick Notes Philosophy was the bases for much of this dissertation. A. Treat academic all stars like sports stars. personal skills of those in the middle. C. Enhance the lives of the less fortunate.